Genoa: Italy's President demanded guarantees on Saturday that all the nation's roads are safe following the Genoa highway bridge collapse, after he hugged and comforted mourners at a state funeral in the grieving port city. President Sergio Mattarella spoke quietly to victims' families before the ceremony began on Genoa's fairgrounds. Usually reserved in demeanor, Mattarella was embraced tightly for a long moment by one distraught woman. He then took his place with other Italian leaders, including Premier Giuseppe Conte and the transportation minister, in the packed yet cavernous hall. Afterward, Mattarella called the funeral, which took place on a day of national mourning, "a moment of grief, shared grief, by all of Italy." One mourner, a local man who would only give his first name, Alessandro, held a placard that read, "In Italy, we prefer ribbon-cuttings to maintenance" — referring to the country's dilapidated infrastructure. "These are mistakes that keep on repeating. And now, for the umpteenth time, angels have flown into heaven and paid for the mistakes of other human beings," Alessandro said. As the city honored its dead, the toll from Tuesday's bridge collapse rose unofficially on Saturday to 43 with the discovery of four more bodies in the rubble and the death in the hospital of the most severely injured survivor. Firefighter Stefano Zanut told Sky TG24 TV that they had extracted from tons of broken concrete the crushed car that an Italian couple on vacation with their 9-year-old daughter had been traveling in. 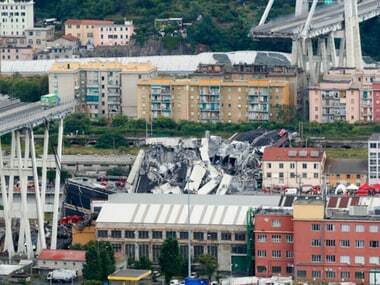 Zanut said the last body pulled out of the wreckage was that of a young Italian man, an employee of Genoa's trash company, who was working under the bridge when it collapsed. The man's mother had refused to leave a tent set up a few hundred yards away from the rubble until his body was found. RAI state radio said authorities now believe there are no more missing in the tragedy. Later, San Martino Hospital said a Romanian truck driver who had suffered severe cranial and chest injuries in the bridge collapse died on Saturday evening. The families of 19 victims bought their loved ones' coffins to the hall for the funeral Mass led by Genoa's archbishop, Cardinal Angelo Bagnasco, who said the tragedy "gashed the heart of Genoa." "The initial disbelief and then the growing dimension of the catastrophe, the general bewilderment, the tumult of emotions, the pressing "Whys?" have touched us yet again and in a brutal way showed the inexorable fragility of the human condition," he said. Players and managers from the city's two major league soccer teams, Genoa and Sampdoria, also attended after their weekend matches were postponed out of respect for the dead. At other bridge funerals on Friday, angry mourners blamed authorities of negligence and incompetence for failing to keep the bridge safe. During the state funeral, applause rang out and many fought back tears on Saturday as a prelate read out the first names of some 30 victims who have been identified. The mourners also applauded Italian firefighters, police and volunteers for the civil protection department as they arrived. Mattarella toured what's left of the Morandi Bridge, which broke apart in a fierce rainstorm, sending a long stretch of road-bed crashing 45 meters into a dry river bed near several apartment buildings. Those buildings have been evacuated and authorities say they will have to be demolished. After the funeral, Mattarella told reporters that the bridge collapse "is an unacceptable tragedy." He demanded that "responsibility be ascertained with rigor" for the collapse of the bridge, which linked two major highways, one leading to Milan and the other toward France. Prosecutors say they are focusing their probe on possible design flaws or inadequate maintenance of the highway bridge, which was completed in 1967. "I, too, have traveled over this bridge many times," said Mattarella, demanding that authorities commit to carrying out their "duty to guarantee the safety of our roads." Responding to harsh criticism, the Italian highway company in charge of the collapsed bridge offered on Saturday to build a new bridge in eight months. Giovanni Castellucci, CEO of Autostrade per l'Italia, the company that manages Italian highways and bridges, told reporters it has a plan to demolish what's left of the largely concrete 51-year-old Morandi Bridge and build a "less imposing" steel one. Italy's government, however, has begun procedures to revoke the company's concession and has vowed that Autostrade per l'Italia will never again run the nation's roads. Castellucci declined to talk about the government's stance. He said even though the cause of Tuesday's bridge collapse hasn't been determined "we apologize" since "perceptions count." Castellucci also said the company would provide funds to help the hundreds of people evacuated from apartment buildings in the shadow of the bridge. But the Italy's new populist government quickly spurned both the offer of help and the apology. "Let's be very clear, the state won't take charity from Autostrade," Deputy Premier Luigi Di Maio, who attended the funeral, said in a Facebook post. "We'll insist on credible reimbursement, and there won't be any bartering. The only road the government will follow is that of going forward with revocation procedures." Players from a local team in Italy's Serie D soccer, Campi Corniglianese, came to pay tribute to one of their own. Among the two Albanian dead was Marius Djerri, 22, who played for the team and was on his way to work for a cleaning company along with his compatriot when their truck plunged into the abyss. "(Marius was) a golden boy. Maybe not the strongest player on the pitch, but as a person, I would like all players to be like him," team president Augustus Pintus said.